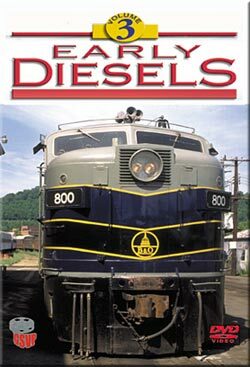 Early Diesels 3 continues Greg Scholl’s fine series on vintage locomotives. A wide selection from about a 20 year time span looks intriguing. Consistent with the previous volumes. High production values and professional presentation. As needed narrative. Plenty of natural train audio, very crisp and clear. First rate videography by Greg Scholl. This show is jam packed with early diesels at work, and in action! A few items. TTI U28B and an Alco are seenoperating in Kentucky. Norfolk Southern has 3 GP30’s in a lash-up on a trestle. Tennesee Valley in Chattanooga, has a sweet Alco RS-1. Chessie System has an old B&O GP 40 #3772 at Prince, WV. in 1987. Leading a pair of Chessie SD50’s and a Family Lines SD40-2, in a classic scene. Check that Post Office! GP9 # 6604 and a ride in the cab! The B&O loco is resplendent in the original blue, grey and black paint. Top it off with the dulux gold striping. Wow! It is a torpedo tube geep. Roof mounted airtanks for newbies. That is as classic as a ’57 Chevy. The geep is mu’ed with an Alco FA as it moves a few passenger cars. Back in the cab with a rare view from, what was once, ubiquitous. A meet with ex: Norfolk Southern geeps and the lash-up to some other early GP types harkens back to an earlier era. Amtrak Capitol Limited with heritage cars and a passing CSX on the mainline sure are a contrast. Fantastic! South Branch Valley has the ex: NS GP9’s with a grain train. The same locos seen earlier. 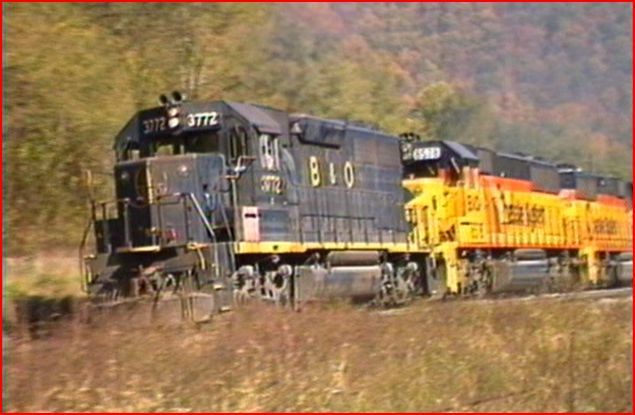 The persistent B&O GP9 shows up with a new partner. One Of the CSX FP7A units. 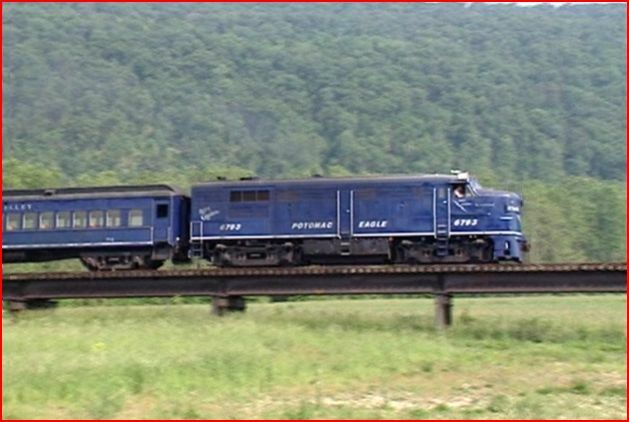 The Alco FP4A painted up like a solid blue Mopac diesel hauls a Potomac Eagle special. Listen to that engine. It has a heritage that includes VIA service. Those were seen in Volume One. This whole chapter is a thrilling look at the vintage engines. On another visit, the camera is in the cab of the Alco FP4A Eagle. Be still my heart! 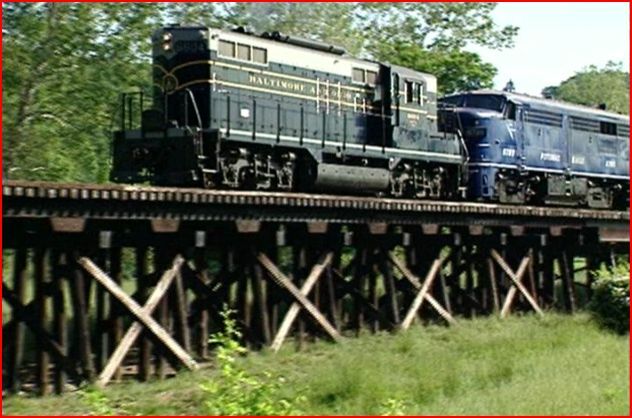 We travel along the Potomac River and the engineer is a real CSX engineer. Beautiful eastern riverfront and heavily wooded scenery. Remember in Volume One, I wrote that you wouldn’t find an owl on a telephone pole in that show. Maybe I can apply for a membership in a Liar’s Club, well..almost. We see an eagle, in a tree. Since we are onboard an Eagle ourselves, why not? I had to laugh at the irony. October, 1995 and peak fall colors along the river at Eagle Rock. A very scenic location. 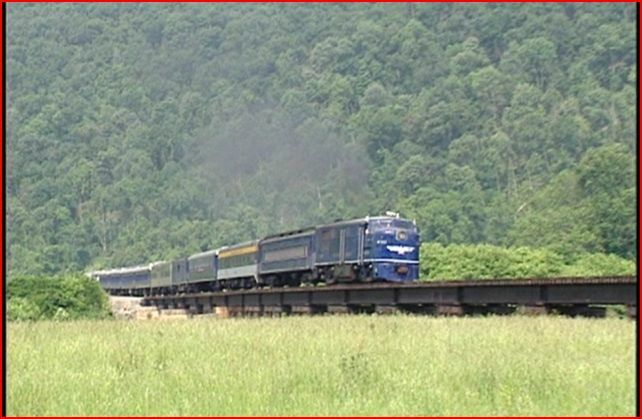 More CSX FP7 #118 and the Alco Potomac Eagle operations, with passenger excursions. The Potomac Eagle feature is another show within the show presentation. Amazing! Transported to east St. Louis in 1990. Gateway Western gets a glimpse. Ohio Central puts up an Alco S-1 built in 1950. This day had the switcher subbing for the steam engines that were off for maintenence. This is excursion service. A glimpse. Point of Rocks, MD. has F7’s upgraded and in MARC service. 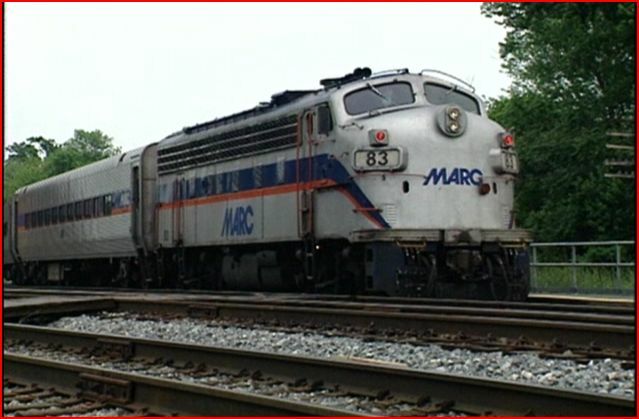 An ex; BN E9 is a shock on another MARC train, still wearing BN colors. Another FP4A is also seen, it was in VIA service. This one is in the classic Baltimore & Ohio capitol dome livery.Unbelievable! Another cab ride in an FP4A. Haven’t seen Brush Tunnel from the cab, before this sequence. Alco RSD-5#1689 is an ex: CNW unit. Black paint and Fireball logo. Also an ex: D&H nee B&M #199, is an RS-3 and they both look hot in that paint scheme. As a special DVD bonus for this release. 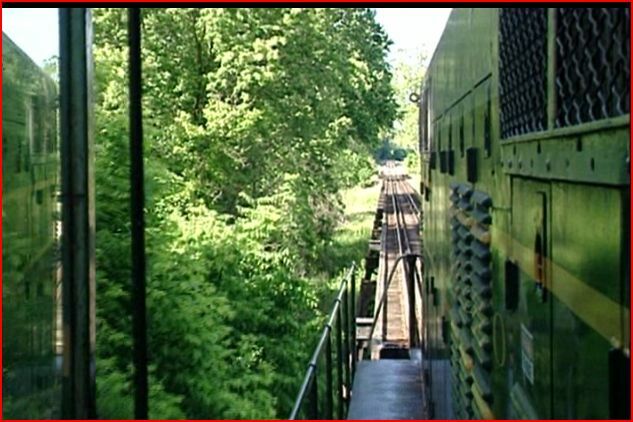 Greg has added extra footage of F7A units #1000 ex: Milw 81C and #1001 ex: Milw. 81A operating on the Ohio Central, with an excursion train. The airhorn reverberates off the hillsides. The pair of F7A’s sure look good. No narration, all natural audio. On screen graphics get it done. Sweet! 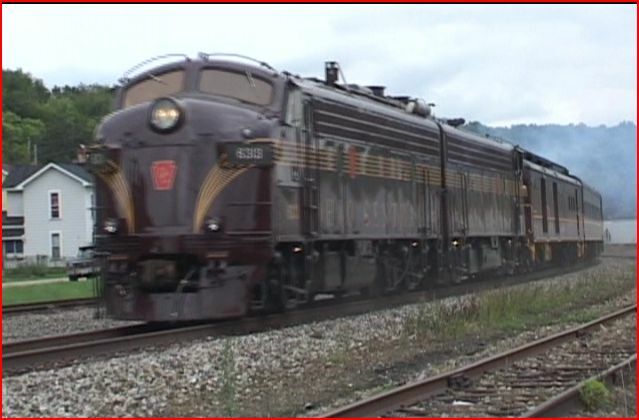 Additionally, we are treated to Ohio Central #6307and #6313 in fresh Tuscan Red with 5 gold stripes. A spot on match for an old Pennsylvania scheme, except for the Ohio Central lettering. These were acquired from VIA. A nice bonus! After viewing all 3 shows, they are all excellent productions. Drawing upon 20 years of video for this third volume. Seems to me that Greg Scholl has saved a supply of the best for the last. 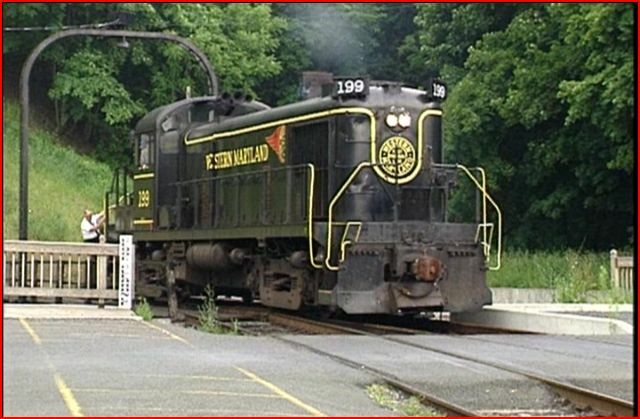 The Potomac Eagle and Western Maryland Scenic provide an up close and personal viewpoint. Maybe that is how it happened to work out. This is the one! 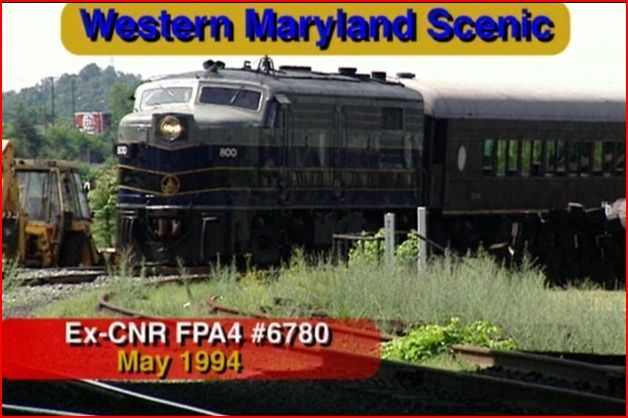 This entry was posted in ATVR Reviews, Greg Scholl and tagged American Train Video Reviews, Amtrak, B&O, C&O, Chessie System, Norfolk Southern, Railroad, Southern Pacific, Train DVD by William J. Hudson. Bookmark the permalink.